You may have files stuck on an old Mac G3 or G4 computer which no longer boots up, or perhaps you don't have the correct cable for the interface connector and want the files transferred to a modern Mac OSX machine, or Microsoft Windows PC. We undertake all types of Mac data transfer and can recover files and convert them for use on newer system. 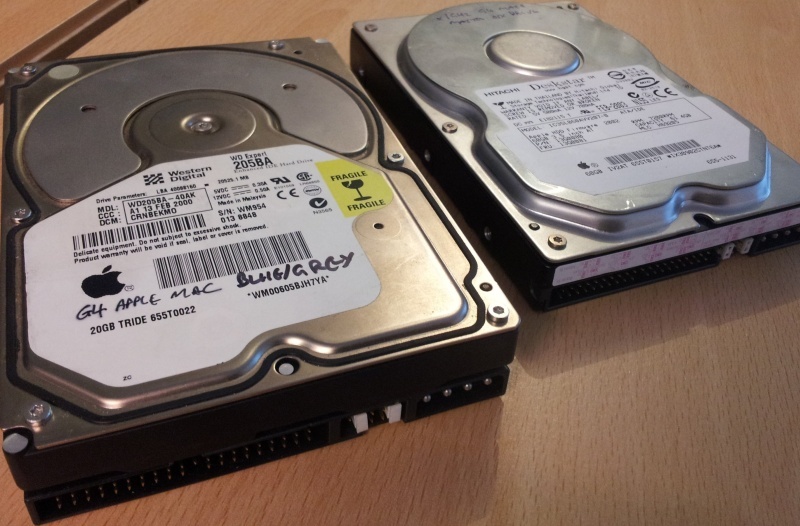 The pair of drives in the image were made by Hitachi and Western Digital including the Apple Logo, and were sent to us for data recovery to a USB drive. If you need a Transfer from Apple Mac G3 G4 IDE hard Drives service, then contact our friendly company. You may have files stuck on an old Mac G3 or G4 computer which no longer boots up, or perhaps you don't have the correct cable for the interface connector and want the files transferred to a modern Mac OSX machine, or Microsoft Windows PC. We undertake all types of Mac data transfer and can recover files and convert them for use on newer system. The pair of drives in the image were made by Hitachi and Western Digital including the Apple Logo, and were sent to us for data recovery to a USB drive..